I’ve often wondered about the flushability of everyday items. I have watched people in movies flushing medications down the toilet, I have flushed my dead fish down the toilet (RIP), and I sometimes wonder whether flushable wipes are truly flushable. Are these seemingly normal habits good ones for our river? Most of the time I don’t think about what goes down my drain. What was once out of sight, was out of mind! But now I cannot stop wondering about what happens once it’s flushed. My mission is to find out what is good to go down the drain, and how to properly dispose of regular, everyday items. Here’s what I discovered. The results are in: no drugs down the drain! I have always assumed that I should put expired medication down the toilet, but I have recently learned that they really shouldn’t be flushed. Scientists find large traces of medications in our bodies of water because they are being flushed and make their way into lakes and rivers. Medications are not always filtered out during the water treatment process. This can negatively impact the health of our waterbodies, as they can be consumed by fish. For example, many fish have been found to be changing due to exposure to estrogen from birth control pills. The male fish are losing their male characteristics, and this problem could wipe out entire communities of fish since they become unable to reproduce. So what should we do with our old, expired, and unused medication? We can bring them to the pharmacy or to a take-back program with local police. That way they can be properly disposed, and don’t make their way into our waterway. While escaping down the drain might have worked out for Nemo, flushing is not the best way to send off our deceased pets. The fish we buy at pet shops are not typically local species that would benefit our waterbody. Most pet fish are exotic, ornamental species from far away. While they are beautiful, they can bring diseases and parasites that our local fish have never encountered. 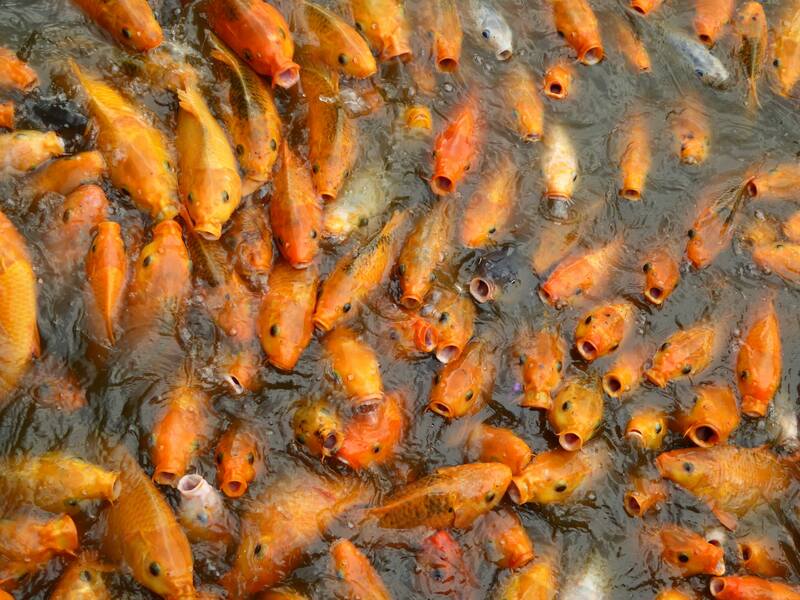 If these fish (dead or alive) are introduced to a local waterbody, they can endanger the entire ecosystem. Also, sometimes the fish we flush might not have actually kicked the bucket, and these exotic species can be extremely invasive. This means that these fish might be able to reproduce, evade predators, and hunt better than the local species, and affect the important balances of the ecosystem. What is the proper way to send off our beloved fish once they have gone belly up? They can be brought to your vet to be properly disposed of, you can bury them, or you can put them in your compost or garbage. If I could bring back my old fish Gill, I would make sure not to send him into our river! It’s right in the name: flushable. Once they disappear down the black hole of our toilet, do flushable wipes break down like toilet paper does? No! Wet wipes, even ones that say that they are flushable, are a big problem for our pipes. By doing a bit of research, I found out that a lot of the things that I used to think were okay to flush, are actually not! Even tissues, tampons, floss, band-aids, and hair should all be thrown in the garbage, and not flushed down the toilet! The only things we really should be flushing are pee, poop, and toilet paper. How does it get to the river? The water from our toilets in Edmonton go down the pipes to get treated at the Goldbar Wastewater Treatment Plant. Most of this water gets to the treatment plant before going into the North Saskatchewan River, but not all of it. On rainy days, our sewer pipes fill up, and instead of going to the treatment plant, they go straight into the river. This is due to our pipe system, known as Combined Sewers. There are 19 pipes in Edmonton that release stormwater, debris, and raw sewage directly into the North Saskatchewan River on days with heavy rainfall, corresponding to 2% of the city’s total discharge. Click here to learn more about these combined sewer overflows, (CSOs). I’ve always known deep down that everything that I put down the drain or flush down the toilet doesn’t magically disappear. However, I don’t often stop to really consider what happens, and I know I’m not the only one. Everything that goes down the drains in Edmonton eventually impacts the North Saskatchewan River. In order to keep our water clean for ourselves, for the plants and animals that depend on it, and for all of the other communities living downstream, we need to pause and reflect before sending anything down our drains.